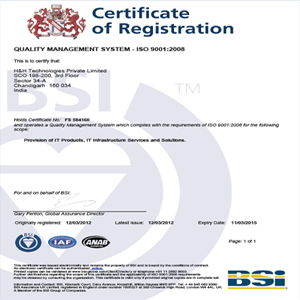 The Quality Management System of H&H Technologies has been certified for ISO 9001:2008. Scope as per certification: Provision of IT Products, IT Infrastructure and Services. 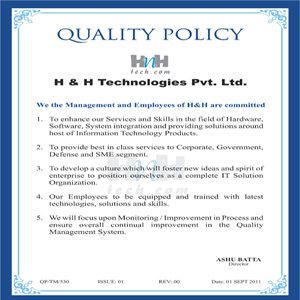 H&H Technologies Pvt. Ltd is a quality conscious organization, managed by Engineers and trained professionals, having vast experience in field of software, hardware and related field where we offer our services to various clients. H&H Technologies Pvt. Ltd has made a niche in the above mentioned services. The development, verification and techno-commercial processes have been identified and developed based on determined criteria and approved methods. The system is reviewed by the management for all aspects enunciated in the International standards Implementation actions necessary to achieve the planned results and continual improvement of the process are undertaken by following the principle of Plan-Do-Check and Act. The following diagram depicts the process. • To enhance our Services and Skills in the field of Hardware, Software, System integration and providing solutions around host of Information Technology Products. • To provide best in class services to Corporate, Government, Defense and SME segment. • To develop a culture which will foster new ideas and spirit of enterprise to position ourselves as a complete IT Solution Organization. • Our Employees to be equipped and trained with latest technologies, solutions and skills. • To focus upon Monitoring / Improvement in Process and ensure overall continual improvement in the Quality Management System.